Make Mine Marvel! This week, the True Believers came out of their meeting of the Merry Marvel Marching Society and… FOOM! Lots of questions about Marvel products from Diamond Select Toys! Form our popular Marvel Select action figure line to our super-hot Marvel Gallery PVC line to our cult-favorite Marvel Retro line, DST president DSTChuck is answering your questions as best he can, although nobody at DST can see the future. But we’re working on it! If you don’t see your question below, submit it in the drop-down form up top or e-mail DSTChuck! Hi gang! I picked up my Gallery Netflix Punisher and Daredevil the other day. Amazing sculpts. Perfect detail and you are getting very good with the facial likeness. However, I do have to voice one complaint. 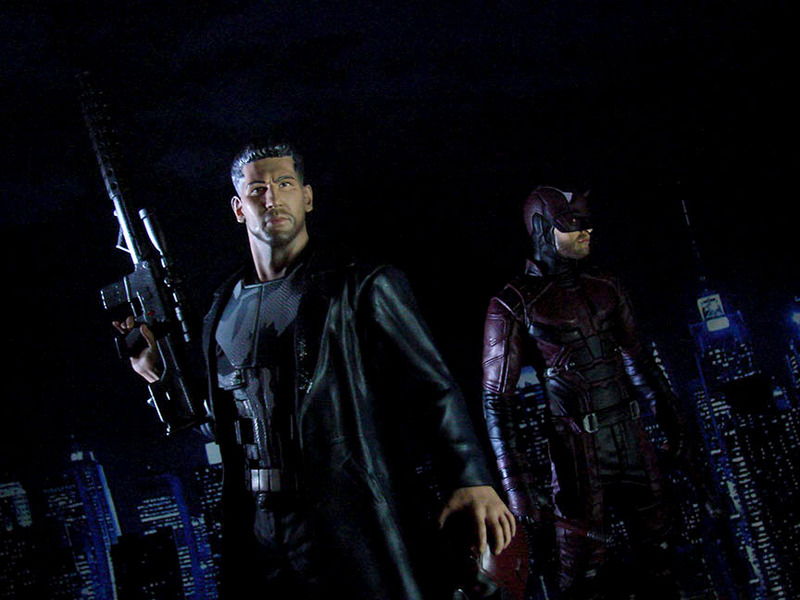 The scale of Daredevil compared to Punisher. DD is much smaller, when both actors and the characters are the same height. This is not the first time the 9″ scale has been off, such as the very large Deadpool and very small Iron Man. It is truly my only complaint about this amazing line. Just one small tweak would make it just perfection :) Now onto my weekly wish list! DSTChuck: We did have some folks ask about the size at trade shows, but another factor is that the Punisher base is higher than the Daredevil. We do try to keep the Gallery line in scale with each other, but I am sure we can do better, and we are trying to keep a close eye on it. Hey guys! Thanks for amazing action figures and statues from the Marvel Cinematic Universe, in the Marvel Select and Marvel Gallery lines. Are you making a Marvel Select Jessica Jones from the series? Thanks. DSTChuck: Our Gallery PVC of Jessica Jones from the Netflix series should in stores in a couple months, but we do not currently have plans for a Select figure. If Daredevil does well, we’ll see. Any plans for more Legendary Marvel Super Heroes action figure sets? 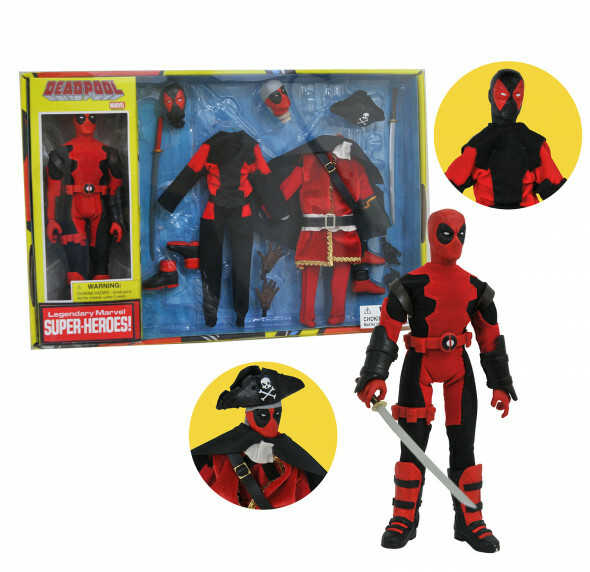 DSTChuck: The next Retro Cloth set will be a new Deadpool set with his NOW! costume, his Weapon X uniform and a pirate outfit. After that, we’ll have to see! They are fun to make, but the Deadpool sets are our strongest performers by a wide margin, and finding someone who inspires that kind of demand and fits our current template is difficult. Hi DST, I was wondering if you are planning on re-releasing the Carnage and Venom figures by Jean St. Jean? DSTChuck: We are planning another production run for Venom in 2018. Hey gang! So excited after seeing your NYCC reveals!! 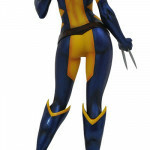 I have been after X-23 since Captain Marvel. LOL Please tell me we will have some variants for her??!!! Also, very excited to see your Black Widow. hopefully we will see a movie version as well. I really like that you are offering new sculpts for your Netflix DD, Jessica Jones, and Iron Fist. It gives a nice option to those that prefer “Action” poses versus “Museum” poses. DSTChuck: We would love to do a maskless X-23, and we would also like to do a Black Widow from Avengers. Thanks for the support! Is 2018 the year we finally get a Marvel Select Beast? How about a Marvel Select Lockjaw? DSTChuck: One of those certainly is possible! Any Plans for a Rogue Marvel Select? DSTChuck: She is often considered, so hopefully it’s just a matter of when. 2. Since you guys do such a great Carnage and Spider-Man have you thought about doing a Spider-Carnage figure? DSTChuck: Carnage is one we often consider for another production run, but no plans for Spider-Carnage at this time. Sorry! 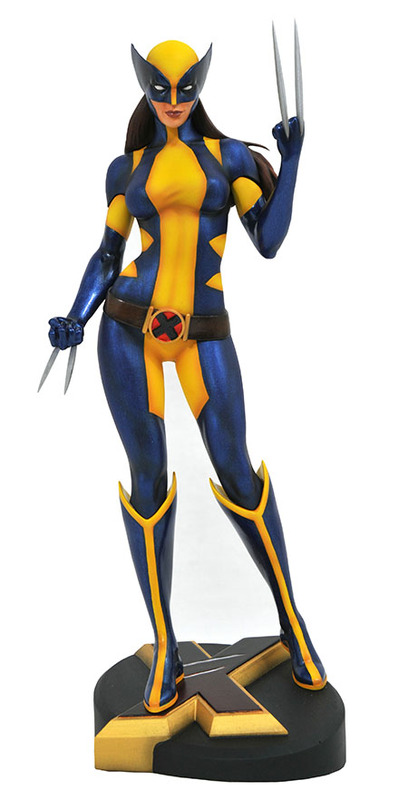 You should really consider making a 7 or 8-inch action figure of a Sentinel from the X-Men comics. 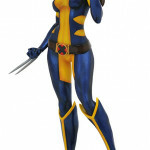 It would be nice to have a Sentinel figure that’s impressive to look at, but not so big that it’s awkward to handle. You could include miniature X-Men figures to show how big the Sentinel is supposed to be. DSTChuck: That’s a cool idea, but we’ll have to see. Regarding Marvel Selects. Have you ever considered doing a Sandman figure? I believe if done with some thought you might be able to get a Sandman and a Hydroman with only a small amount of new/different parts– new head, different paint, maybe different weapon accessories. A nice base that the legs can lock into would allow for crazy arm attachments. DSTChuck: I think just about every character even remotely connected to Spider-Man has been considered. 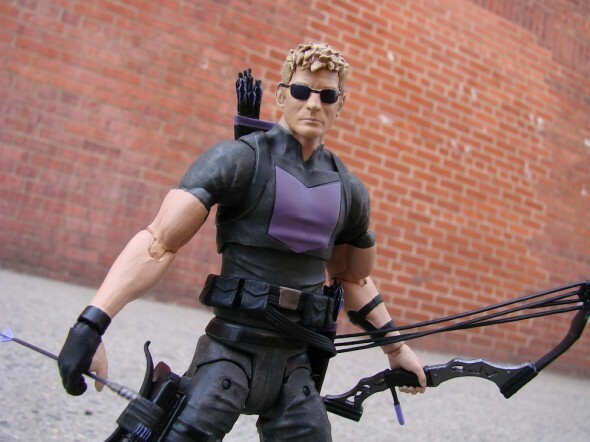 I’m curious if an Avenging Hawkeye reissue is possible/likely. I absolutely love that figure, but I didn’t get into the line soon enough to get my hands on it. On a separate note, I’m really impressed with your upcoming Netflix Daredevil Marvel Select. I’ll definitely be buying it as soon as I can and hope to see more Netflix-based figures in the future (Punisher especially). DSTChuck: I don’t see why another production run would not be possible, but we will have to talk to the Disney Store, as that is their exclusive. The Daredevil should be in stores now, and I hope it lives up to your expectations. Can you please make a Marvel Select comic book version in the classic Kirby green outfit of the Ronan the Accuser figure? Fans would love to have this added to their collection. 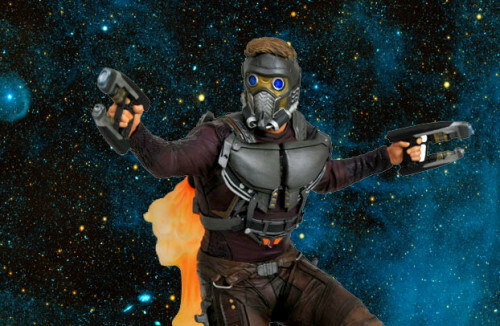 PS, also a GotG movie version is highly anticipated as well but we have never had either in a good action figure form for adult collectors. DSTChuck: Right now we do not have a Ronan planned, but never say never! Still got a question? Submit it in the drop-down form up top or e-mail DSTChuck! Next Up: On Sale This Week: Star-Lord, Nightwing, Iron Man & Zero!